Last year, my youngest daughter began making fleece welcome blankets for patients at our local Ronald McDonald House. She gave a fleece blanket late last spring--and bought the materials to make two more blankets in October....and life got in the way a bit. This past weekend, we brought out the supplies and made another blanket and cut the fabric for a third blanket. This blanket making project is really simple--and many charities readily accept fleece blanket donations--I am not sure why it sometimes takes us so long to spend a couple of hours cutting fabric and tying together a much needed, fleece blanket! 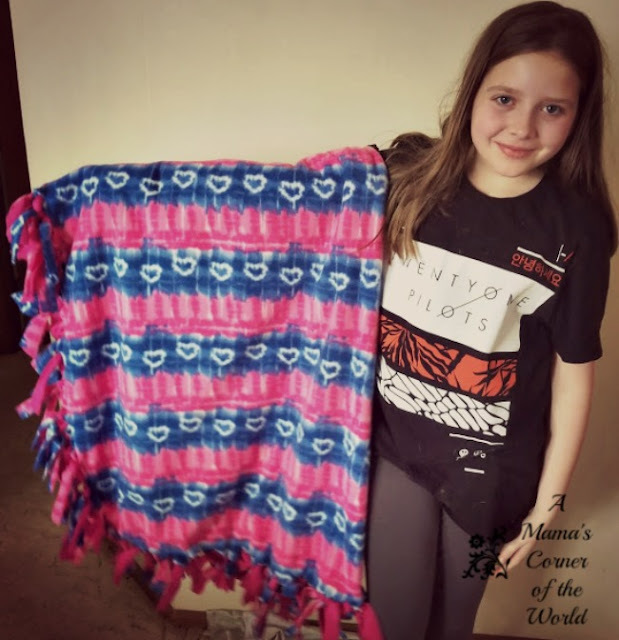 At any rate--we wanted to show everyone how truly easy this blanket-making project is--and share a few of our favorite organizations who willingly accept your handmade blankets. Ready to make a fleece blanket for a charity organization? 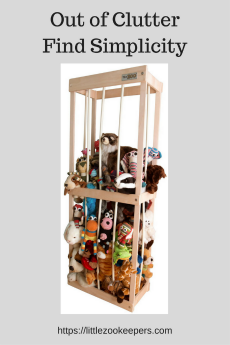 Choose an Organization--and Get Specifics for Blanket Needs. 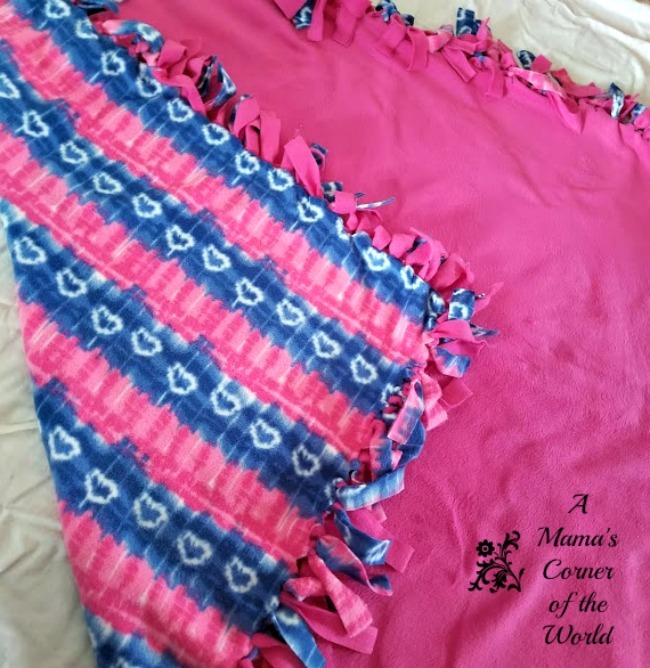 Many organizations accept handmade fleece blankets. Some (like area homeless shelters or women's shelters) simply accept blankets of any size or style. Call local shelters, hospitals, fire houses or nursing homes to see if a local organization has a need for your handmade blankets. Some organizations have specific requests and blanket size requirements. The Ronald McDonald House accepts a specific size for their Welcome Blankets. Project Linus has a slightly different pattern and guideline for the fringed fleece blankets they accept. 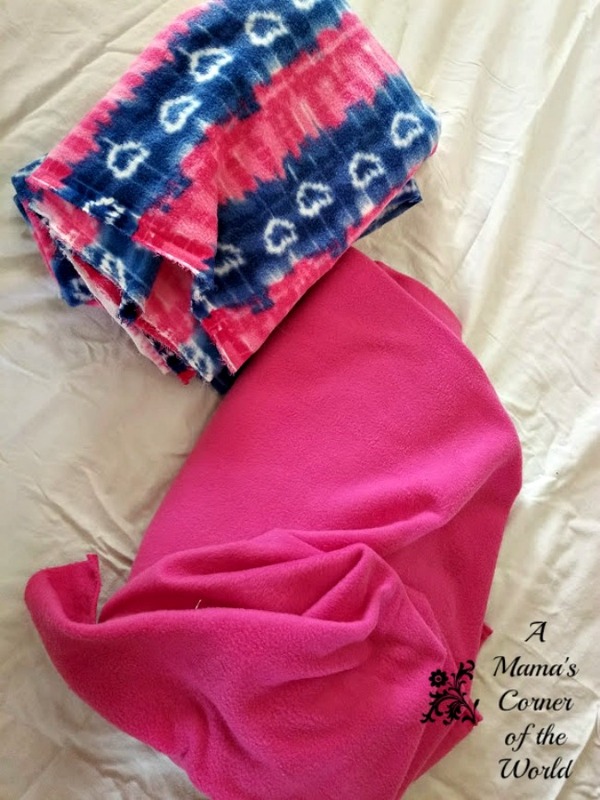 Points of Light offers guidance for creating either sewn fleece blankets for hand tied fleece blankets. Binky Patrol offers blanket patterns for a variety of blankets--including simple fleece ones. No matter the organization--check with them regarding size requirements or needed colors/styles (do they currently need blankets for boys or girls more often?) before making your blanket to ensure that they will be able to accept and use your finished donations. Gather Your Fleece Blanket Making Supplies. Once you have instructions and size requirements for your fleece blanket donation--it is time to choose the fleece fabric. If you are doing this project with a group (such as Girl Scouts or an NJHS chapter--plan to spend a bit of time (A LOT OF TIME) choosing each blanket's fleece color/pattern. Take the group to the fabric store or help them choose fleece colors and patterns online. Creating these blankets really lets the kids (and adults too) share a bit of their personalities (and heart) with the recipients--and choosing special fabrics is one of the most exciting parts of this project for everyone--until they actually deliver their finished products or see their donations in use. General Supplies you will Need to Make a Fleece Blanket for Charity. 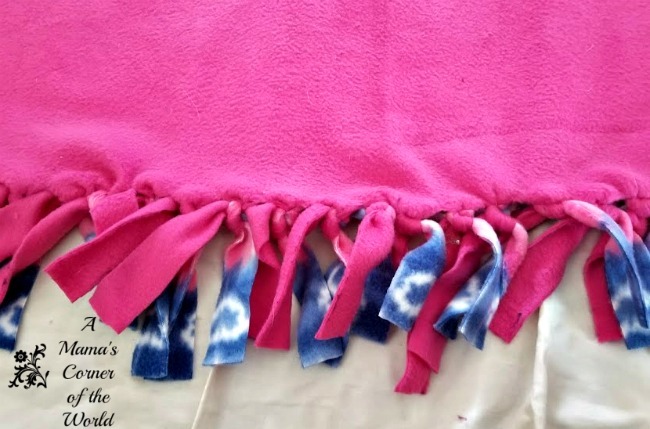 If you are like most of us--you do not have a large cutting mat--or even a lot of working space--but, you can still make a fleece blanket to donate. I am sharing our tips for making a fleece blanket for charity without a cutting mat or large working surface. Cut the Fleece into a Rectangle. 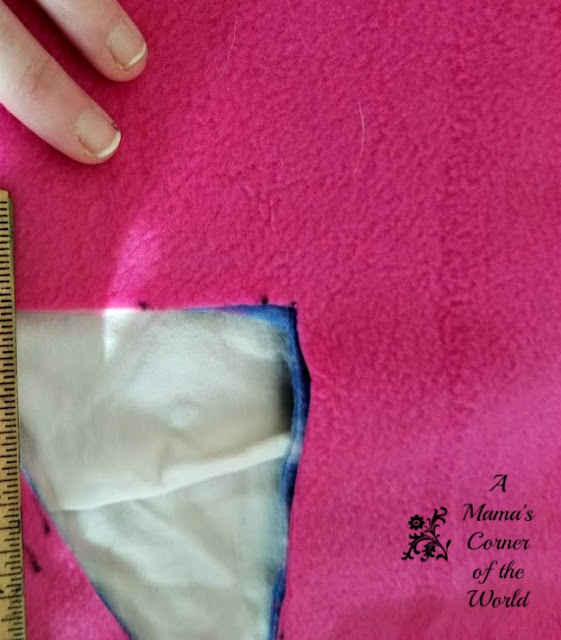 Place the solid colored fleece on top of the printed fleece, out flat on a clean working surface or over a large queen or king sized flat sheet, so that the dull sides are facing each other. (The bright, bold colors should be facing outward on both the bottom and the top fabrics.) Cut the fleece into matching dimensions of the desire size. We used dimensions of 56"x 70" for our blankets. We simply measured, marked and cut both layers of the fabric to the desired dimensions as they lay "back to back" using a fabric measuring tape, a fabric marker and sewing scissors. Cut a 6 inch Square from each corner of your Rectangle. These cuts give the blanket its corners--and makes room for the 6-inch tie-off strips you will make next to finish your blanket. We used a fabric marker to guide our cuts. 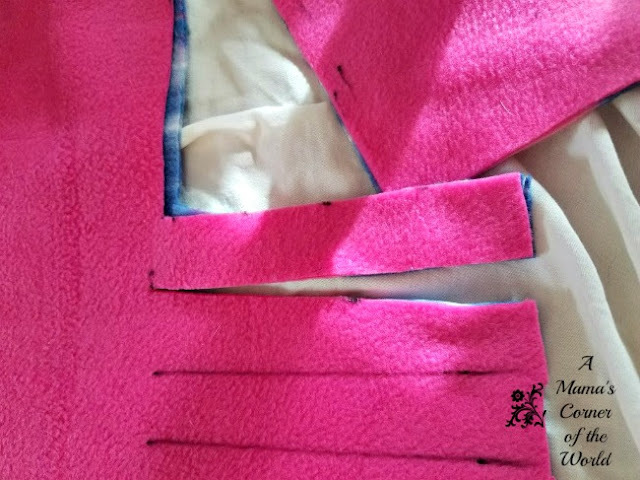 Cut 1x6 inch strips along the fleece edges. Cut 1-inch strips of fleece measuring 6 inches into the edges of the fleece rectangles all the way around (excluding the squared corners). I used a fabric marker, measured the width of a ruler (which was roughly an inch), and then measured into my fleece 6 inches to draw strips. I drew strip outlines for my daughter to cut. Tie the Strips to "Sew" the Fleece Blanket Closed. Beginning at the corners, ties off a top and bottom strip from each of your 1x6 cuts to create a knot. We like to tie off 4-6 on each side of each corner square before continuing down the side to ensure that the fleece stays together and lays smoothly as we tie it all off. You may see some "puckering or stretching" around your knots and that is fine--just try to keep the knots tied fairly evenly and the blanket will come out okay "in the wash"! Wash & Dry the finished blanket--according to your Organization's Washing Instructions if they have them. We tend to wash our fleece blankets in a No Scent/Pure/Allergen Free laundry detergent and dry without a fabric softener before donating. You organization may prefer that you not wash the blankets at all before donating. Ask before washing/drying to ensure that your efforts and donation can be accepted by your organization. Donate your Blankets. Do you need to ship your blankets to your organization or choose a local drop off location? Check local drop off hours and plan to drop off your donated blankets during those hours. Most of these facilities may offer receipts for tax deductions--or signatures for students' community service or NJHS hours--but, you may need to provide them additional information or come prepared with your own forms. Be sure to know what you need to claim tax write offs or log credits for service hours before you arrive to donate--or before you ship those blankets via FedEx. 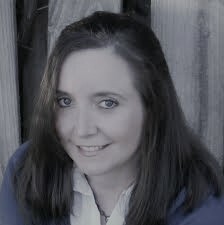 Ask about needed forms or such details when you call about specifics or donation hours. 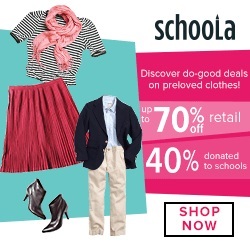 Take your Donation a Step Further. If you are able to drop off you blanket personally, ask for a tour of the facility and consider scheduling time to volunteer at the facility receiving your blanket. See your blanket making a difference. If you cannot volunteer at the facility directly due to age or time restraints, check out online volunteer opportunities or needs for off-site volunteers. Or--just go home, buy more fleece and make more blankets over the next year. Making fleece blankets for charitable organizations is a great way to get that social good initiative started at home or as part of group. Make a blanket---then see what efforts that blanket encourages you, your family or your group to support next.